We joined the Beacon Food Forest's work party to help weed and get the garden prepared for the summer. According to their website: “The goal of the Beacon Food Forest is to design, plant and grow an edible urban forest garden that inspires our community to gather together, grow our own food and rehabilitate our local ecosystem.” The Food Forest started in 2009 and has 1.75 acres of planted and completed space.They are working on the next 1.75 acres of their 5 acre space. The work parties are open to the public. 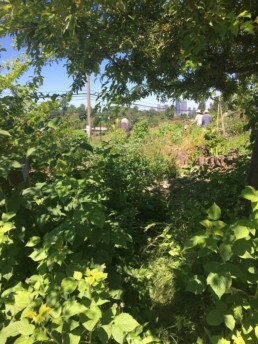 BWB Seattle joined in their monthly work party to see what the Food Forest is all about. A few of us headed over to the Beacon Food Forest on Beacon Hill. They have about 2 acres of plants ranging from gooseberries and raspberries to tomatoes and herbs. We helped weed out as much morning glory as we could. Before covering some overtaken areas with cardboard burlap and wood chips. This helps keep down the weeds and morning glory while protecting the shrubs and plants that we want to be there.